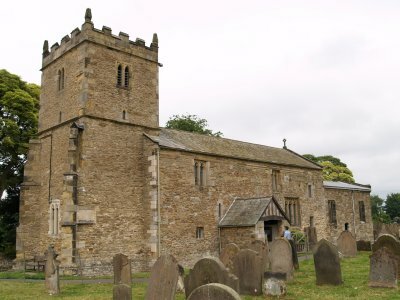 The north wall of St Martin's Church, Bulmer and the low Perpendicular west tower. Unusual herringbone stonework on the south wall. More characteristic of pre-Norman Conquest stonework by Saxon and Danish builders. 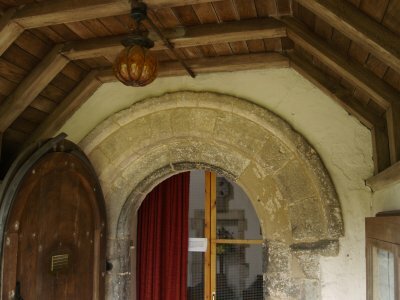 The late 12th century south entrance doorway. 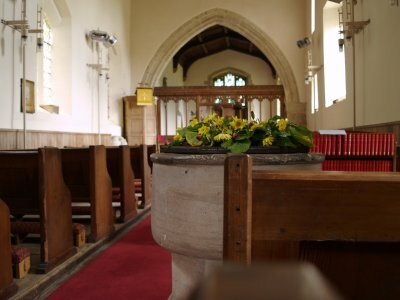 Looking beyond the 13th century curved font bowl, down the 12th century nave through to the 15th century chancel arch. The late 13th century effigy of praying knight in chain mail is one of the oldest surviving medieval effigies in Yorkshire and is believed to honour Sir John de Bulmer who died in 1268. The legs were broken off to make way for the pulpit! 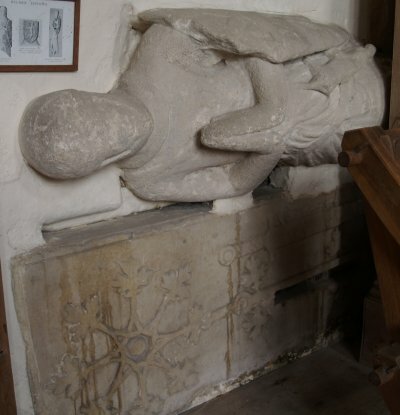 Below this is a foliated cross and sword typical of a 12th century tomb.